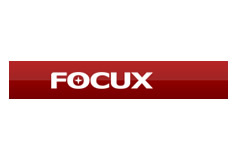 Focux Audio 는 디지털시네마 환경에 맞추어 최신 기술을 도입하여 극장환경에 맞는 오디오제품을 개발하였습니다. 세계 최초로 무선으로 작동하는 사운드 프로세서를 개발하였으며, 에너지효율을 극대화하고 앰프 1개당 4채널당 1,000W를 제공하는 최신 Class D방식의 시네마용 앰프를 개발하였습니다. 또한 스피커에 있어서는 Coaxial 드라이버 기술을 시네마 스피커에 도입하여 기존 스피커에 비해 더 선명한 음질을 제공합니다. Focux Audio 는 음질 대비 뛰어난 가격성능비를 가진 제품을 극장에 제공하는 것을 목표로 모든 제품을 개발합니다. The FOCUX coaxial loudspeaker are designed to reproduce dialogues, large dynamic scenes, ambient sound, and soundtrack music well, which allow moviegoers to enjoy an extraordinary acoustic experience. FOCUX’s cutting-edge technology combines the Hi/Mid range. The mid-range and high frequency play from the same location, which effectively remove sound interference, and perfectly reproduce the accuracy and delicacy of the sound. 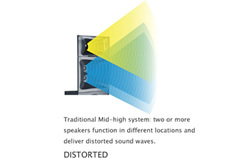 The X Series is the world's first cinema coaxial screen channel speaker system. X15, X20 and X30 are also the most compact three-way systems in digital cinema so far. It performs extremely well in very compact spaces. This design can shorten the distance of Hi, Mid, and Low frequencies; therefore, it provides smooth and perfect reproductions of movie soundtracks. This technology completely bypasses tradition. 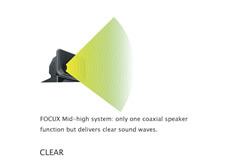 The delicate design of the FOCUX speaker appears in the X Series. 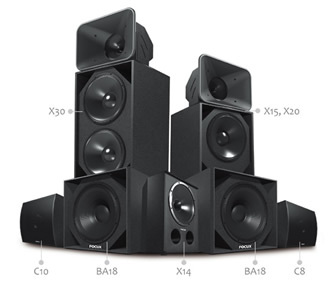 Integrated with the technology of a coaxial speaker and an excellent horn system, the X Series features a more powerful dynamic output so that audiences can enjoy the accuracy, quality, and reliability of a complete cinema audio solution. The C series surround speaker is the world's first cinema coaxial surround system and features excellent sound performance. This design makes the C8 and C10 surround speakers perform with perfect sound quality. They bring accuracy and clarity to cinema sound. The BA18 is designed to provide low-frequency with ample headroom in critical applications. Another feature is that the BA18 can be used in Arrays. With its compact design, it can be used in arrays to deliver very low distortion for ultimate low-frequency clarity. Just place two or more BA18 subwoofers in a specific location and the result is a more powerful and ultra-low sound performance. Therefore, maximum output can be generated with fewer subwoofers making this system highly efficient.